Word is, we've hit peak prosecco. Its frothy bubbles and light peachy flavours were fun, but now we're ready to rediscover something a little more serious. But serious in the best possible way, because what makes cava that bit more interesting is the fact that it's made in the same way as Champagne. That means, unlike prosecco, the second fermentation, which is responsible for creating the bubbles, happens in the bottle, not an industrial tank. When it comes to production, prosecco is the Speedy Gonzalez of the sparkling wine world. As soon as the bubbles appear, it is bottled fresh out of the tank and is winging its way to a shelf near you, while the bottles of cava are just beginning to settle in, lying on "lattes" (on its side on slats), and ageing in the bottle for a minimum of nine months to develop the richer, more complex flavours it is known for. That's my type of fizz. While you'll find plenty of easy drinking styles of cava at the inexpensive end of the market, there are different levels of quality, and for a few quid more, you could be drinking a very interesting bottle indeed. Cava's history goes back to 1872 when Josep Raventós returned from France after spending time learning about Champagne production and was the first to produce a sparkling wine in Spain made from indigenous grapes, using the traditional method. There are a number of grape varieties that can be used in the production of cava, but the big three are Macabeo, Xarel-lo and Parellada, which are typically blended together to give cava its characteristic flavour. I know, not grapes we're particularly familiar with, but generally it's held that Macabeo provides the fruit, Xarel-lo brings structure, good acidity and an earthy quality, and Parellada brings a perfumed top note. Like Champagne, cava can be aged for a number of years, and if you look carefully at the label, you'll be able to get an indication of the age of the wine in the bottle, which is similar to the classification system used in Rioja. Entry level cava, classified as traditional, is aged for nine months; reserva is aged for 15 months; gran reserva is aged for 30 months; and the new premium classification, cava de paraje calificado, stipulates that the cava must be aged for a minimum of 36 months. In fact, many of these cavas are aged for much longer, so it's worth checking to see if the number of months is also mentioned on the label. 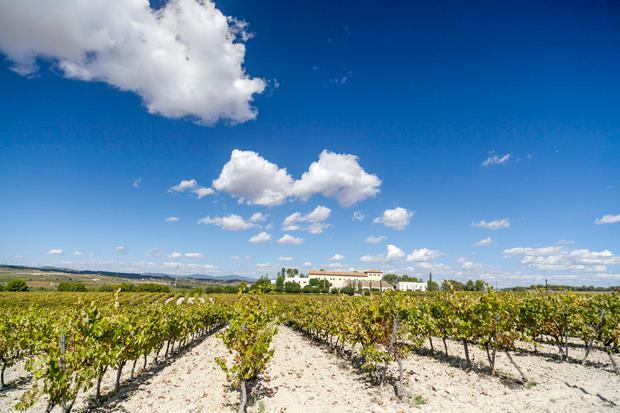 So far, just 12 cavas have been awarded the cava de paraje calificado, which not only requires extended ageing but is also terroir-driven, as all of the grapes must be hand-harvested and come from a single vineyard. What you might not know is that it's very easy to visit some of the cava cellars and it is well worth doing. While cava can be made in a number of regions in Spain, 95pc of it is made in the Penedès region. So if you've ever been to Barcelona, it's just a 40-minute drive out of town (and there are organised trips you can book), or if you've been to Sitges, it's right on your doorstep. With the stunning mountain of Montserrat in the background, vineyards dominate the landscape, reaching from the plains up into the hills where there is a patchwork of recently revived vineyards producing top quality grapes. On a recent trip to the Penedès region (pictured left), I was amazed to see how many different styles of cava there are and how much experimentation is going on there. Organic farming has become increasingly popular and there is a move towards biodynamic viticulture among some of the smaller houses. I was lucky enough to have a chance to visit Parés Baltà, a family-owned traditional winery. Run by brothers Joan and Josep Cusiné, they both had the incredible good fortune to marry oenologists, so the wines here are made by their wives, Elena Jiménez, who originally trained as a chemical engineer, and Marta Casas, who is a pharmacist. As we headed up a dirt road in Joan's SUV into the hills of a nature reserve above the village of Torrelles de Foix, past tiny pockets of land cultivated in sporadic parcels, we stopped to take a look in the shed where they keep some of the biodynamic treatments they use in the vineyard. A huge compost heap by the side of the road was releasing earthy puffs of steam into the warm air, and Joan explained that it was ready to be spread in the vineyards over the coming days. In the shed, with light streaming in, Elena showed me the horsetail and yarrow they had collected which were hanging up to dry - they would be used in other preparations later in the year. In a copse further up the hillside, we stopped to see the remains of a kiln dating back to 400BC. Apparently there are numerous similar sites on the mountain and as grape seeds have also been discovered in the same area, it is possible that these kilns were used to make amphora, the traditional urn for fermenting wine. To continue the tradition, they have had an amphora custom-made from the clay from this hillside and they are using it to age wine made from Xarel-lo. The wines from Parés Baltà are not yet available in Ireland, but it's worth looking out for them if you're visiting the region. I picked up a bottle in a good wine bar in Sitges, so I'm looking forward to cracking it open some sunny evening. If you're looking to do a tour when you're there, the cellars of Agustí Torelló Mata are well worth visiting. They make very highly regarded organic cava, which is available in Ireland (see above right) and it's a really cool space to visit as it's not a huge operation. Juvé y Camps, which makes a cava de paraje calificado, is also worth visiting, and for the cava big guns, check out Codorníu. With stunning architecture, a museum and miles of cava-filled tunnels which you can travel through on a small train, this has a touch of Disneyland to it. In the meantime, why not do your own cava-tasting at home? Get a group of friends together, split the costs and buy some of the more unusual bottles, and you'll get a good idea of how different the styles can be. While the word 'vintage' has little meaning in the context of cava, as it is typically made from the grapes in one year, this is a nicely made cava with complexity on the nose and flavours of crunchy apple, earthy fennel, and a touch of nuts adding richness. Made with zero dosage (the addition of a small amount of sugar which is typical in Champagne), this has notes of lime marmalade and brioche on the nose, and is fresh on the palate with flavours of apple, lemon, blanched almonds, dried apricot and a touch of wax on the finish. Another top zero dosage cava, this is aged for 89 months and is a blend of 58pc Macabeo, 39pc Xarel-lo and 3pc Parellada. With deep tertiary flavours and layers of rich complexity, this still retains some freshness to balance the flavour profile. Based on the first Llopart Cava produced in 1887, and aged for 50 months, this has a creamy texture with evolved flavours of dried apricots, nuts, lime, hay, wax and a chalky saline finish. A very interesting, complex cava. I recommended this for easy entertaining - if you're looking for simple, inexpensive bubbly, this will do the trick with its easy flavours of lemon, lime and ripe apple. Quaffable and better quality than prosecco. This winery broke away from the cava denomination of origin in 2014 and is the first to become organic in Spain. This is a superb sparkling wine with fine flavours of lemon, quince and a touch of marmalade.